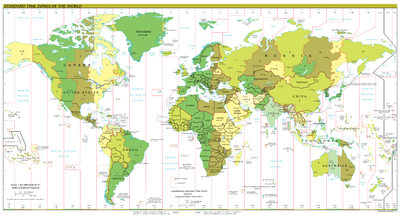 You may miss important obligations simply by not understanding what will be the correct local time as you travel. If starting the reverse course by midday, you may well arrive but a few clock hours more or less on the same calendar day. If you travel has time zone complexities or possible impacts on your health or comfort, consult an expert as you plan it. Jet lag is a mismatch between your body clock and the local time wherever you are. It's caused by rapid travel across time zones. Jet lag is also compounded by the fact that long hours spent on a plane can cause you to sleep too much, or not enough, possibly at the wrong time of day relative to where you departed from. The fatigue from travelling plus the mismatch with local time can leave you ready to fall asleep just after lunch, or being wide awake in the middle of the night, knowing that dawn is still several hours away. Where flying isn't concerned, it isn't the length of the flight that matters... only the difference in time zones. Flying from Paris to Johannesburg, while it might take you 15–20 hours, wouldn't leave you very jetlagged because there's only 1 hour time difference. A flight from New York to Tokyo, on the other hand, leaves you with a 13-hour difference, which effectively means reversing your sleep/wake schedule. Flights from east to west, where you gain a few hours, are usually a bit easier, as most people find it easier to stay up a little later than to go to bed earlier. But that only works within about 4 or 5 hours difference. Recovering from jet lag is a process that, well, takes time. A rule of thumb is that you recover about 1 hour difference per day. You may find that on your way out, you are fine after just a couple of days, but you will really notice the recovery period on your way home, particularly if you didn't stay long enough to fully adjust to the original time difference. At that point your body clock will be really confused and it will take a while for it to sort things out. You can aid the process a bit by helping to reset your body clock. Sunlight plays a big factor in this and it helps that the sun is out on your first day. Avoiding jet leg isn't really possible, but you can make things easier on yourself by trying to operate on your new local time as early as possible. If you're going to land early in the day, try to sleep on the plane so you arrive refreshed and ready for a full day of activity. Conversely, if you're going to arrive near the evening, try to stay awake on the plane so that you'll be tired when you arrive and can get a lengthy sleep. As much as possible, spend the daylight hours first few days in your new timezone outdoors. Brazil: Brasilia, Rio, São Paulo, Fortaleza, Maceio, Recife, Salvador etc. United States of America ("Eastern Time"): Maine, New Hampshire, Vermont, New York, Massachusetts, Connecticut, Rhode Island, Michigan except extreme northwestern counties, Indiana except the southwest and northwest corners, Ohio, Pennsylvania, New Jersey, eastern Kentucky, West Virginia, Virginia, Washington, D.C., Maryland, Delaware, eastern Tennessee, North Carolina, Georgia, South Carolina, Florida except western part of panhandle. United States of America ("Central Time"): Wisconsin, Illinois, the southwest and northwest corners of Indiana, western Kentucky, western and middle Tennessee, Mississippi, Alabama, Minnesota, Iowa, Missouri, Arkansas, Louisiana, north and east North Dakota, eastern South Dakota, middle and eastern Nebraska, most of Kansas, Oklahoma, most of Texas, part of western Florida (panhandle). This page was last edited on 28 October 2018, at 14:57.